Today I was tasked with wax potting a pickup from a cool old Telecaster, as it’s Lindy Fralin pickup had become extremely microphonic. 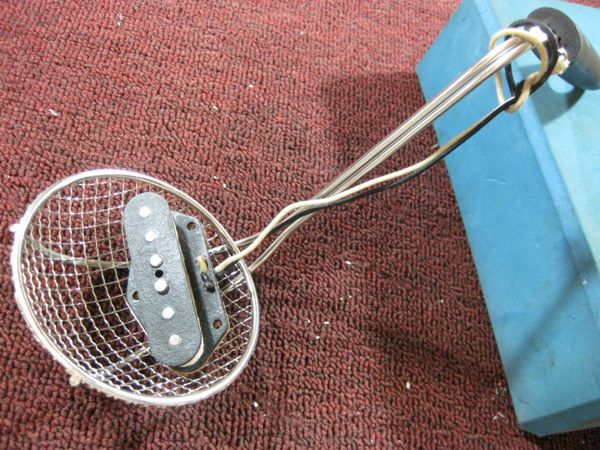 Microphonic pickups tend to amplify non-musical sounds, such as taps and bumps on the guitar’s body, and will oftentimes squeal like a pig even at low volumes. Usually the root cause of a microphonic pickups is that the internal coils are loose, and are vibrating within the pickup’s magnetic field, causing electrons to flow uncontrollably, and this create very unmusical sounds. Most pickups are wax potted from the factory, but even then some of them can develop microphonic problems. Fortunately, fixing a microphonic pickup is cheap and easy, so you don’t have to throw away your bad pickup: just wax pot it! 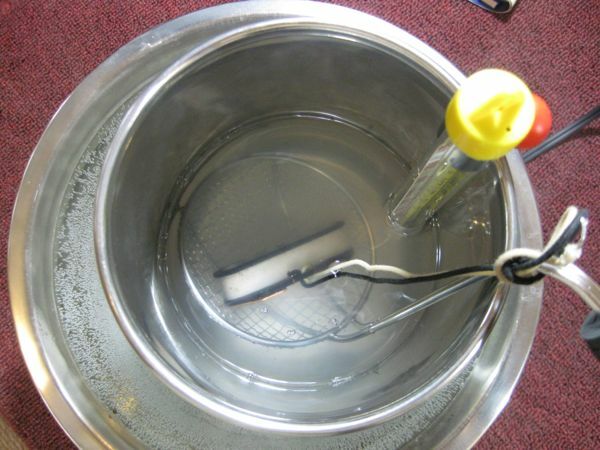 When potting a pickup, I first melt up a mess of wax – a combination of paraffin wax and beeswax. 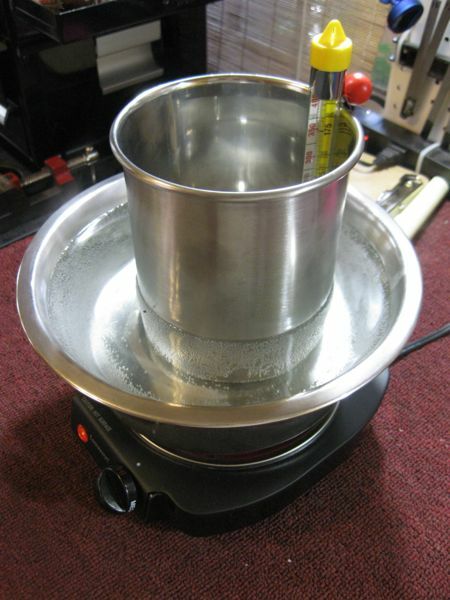 I use an electric hot plate, a dog bowl filled with water, a steel canister, and a candy thermometer, and heat the wax to 65º C (150º F). The melted wax will penetrate the pickups coils, essentially creating a shock absorber for the pickup winds, as well as securing them in place. It usually takes about 10-15 minutes for the wax to fully penetrate the pickup, and I occasionally gently shake the pickup to release any trapped air bubbles. Once the the pickup doesn’t let off any more bubbles, it’s usually ready to go. I pull out the pickup, and rest it on an old shop rag to allow it to cool. I wipe the soft wax off the top before it cools completely – cleaning it after it’s fully solidified is a real pain, so it’s best to do this now! And that’s pretty much it! Once the wax has cooled completely, I’ll pop the pickup back into the guitar and test it out to make sure it sounds the way it should. 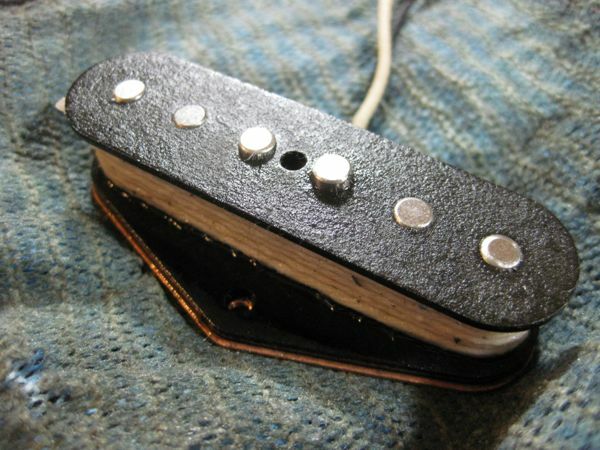 As you can see, it’s a fairly simple process, and one that can save you $100 or more versus buying a new pickup.